Are You Forgetting These 5 Creative Ways to Promote CTAs? You’ve probably spent hours writing and designing ebooks and visual aids for your webinars. Don’t let all that work go to waste. Make sure to take advantage of creative ways to promote CTAs. We’ve found a few basic techniques to ensure you are getting as many leads as possible off your landing pages. The first way to make sure you’re utilizing your opportunities is to make sure to promote your offers on every single website page. You can use CTA images and/or buttons to link to your offer on each page. Consider why a visitor may be on each particular page and then decide what specific CTA would relate best to them while they are there. Try to visualize where in the sales cycle they might be and then create a related offer for that page. If the goal of the current page is to sell products, consider placing an offer for a free trial on it in order to attract the visitor’s attention. Since you’re going to promote CTAs on each website page, it logically follows that you would also include offers on your blog. You can include a CTA in each individual blog post that is published on your blog. Like the website pages, try to relate the content of the offer to the content of the blog post. Doing so will help increase the rate of click-throughs. 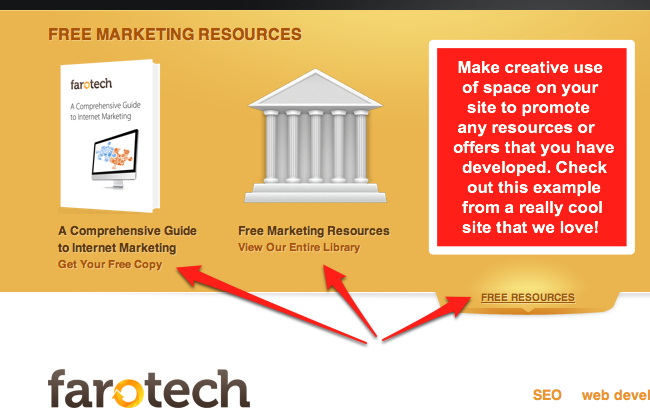 If you promote CTAs that perform well, consider adding those offers to a banner on the top of your blog. You can also include them in your blog’s sidebar. We’ve given you a prime example (and a great opportunity to take advantage of a FREE marketing assessment) right here below! Make sure to utilize your anchor text as well. You can include links to related CTAs using relevant keywords on your web pages, in your ebooks, or even in your blog articles. CTA images or buttons don’t have to be the only avenue to get to one of your landing pages. Anchor text is very useful as well to promote CTAs. For example, right now we’d like to offer you this anchor text to take advantage of our FREE website grader tool! Simply click on the handy-dandy anchor text. This is like CTA inception. It’s an offer within an offer. It sounds crazy, but it works. Your inbound marketing should never cease once a lead has been generated. If your strategy is efficient, you can extend the nurturing process by using content and offers to keep leads involved with your business and your product lines by giving them more opportunities for increased access. Promote CTAs within your webinar materials, ebook content, and within other offers. This is a brilliant way to use middle-of-the-funnel offers to keep your prospects engaged and moving through the sales cycle. The final creative way to promote CTAs involves a wider view. Your website, blog, and ebooks may contain a variety of offers. If your offer base is broad, try fashioning and designing a page or even a few pages on your website where all the offers are featured. Create a library of sorts to promote CTAs and offers. This will allow visitors to see all that you offer in one big picture and then search for what interests them specifically.